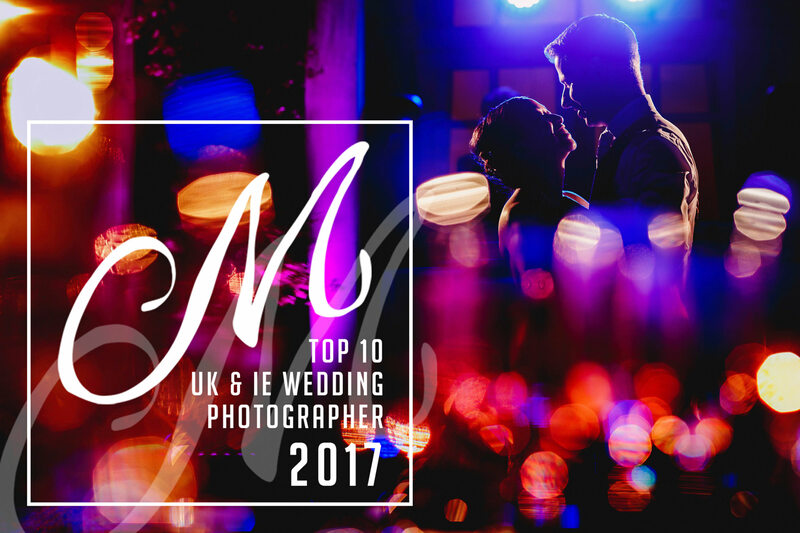 I was over the moon this week to receive this prestigious Top 10 award from the Masters of Wedding Photography UK & Ireland for finishing the year with 13 awards, putting me in 2nd place in the final league table for 2017 – in the whole of the UK and Ireland! That feels like a pretty immense achievement and definitely one worth shouting about here on the blog! Awards have been a cornerstone of my business over the last few years and I’ve been lucky enough to win some pretty sought-after ones, including Best of the Best and Wedding Photographer of the Year, as well as regular image awards from all the major award bodies in the international wedding industry. I put a huge amount of pressure on myself to create amazing, emotive photos for my clients first and foremost, and getting recognition from my peers is the icing on the cake. It keeps me accountable and consistently hungry to keep improving and working hard at every single wedding. So it’s amazing to receive this latest award from Masters of Wedding Photography and I’m very proud to be in their top 10 of 2017! Thanks to Masters of Wedding Photography, the judges and above all my clients for giving me the opportunity to do what I love week-in, week-out. All my 13 award winning wedding photos are below, with a little bit more information about each one. Enjoy! 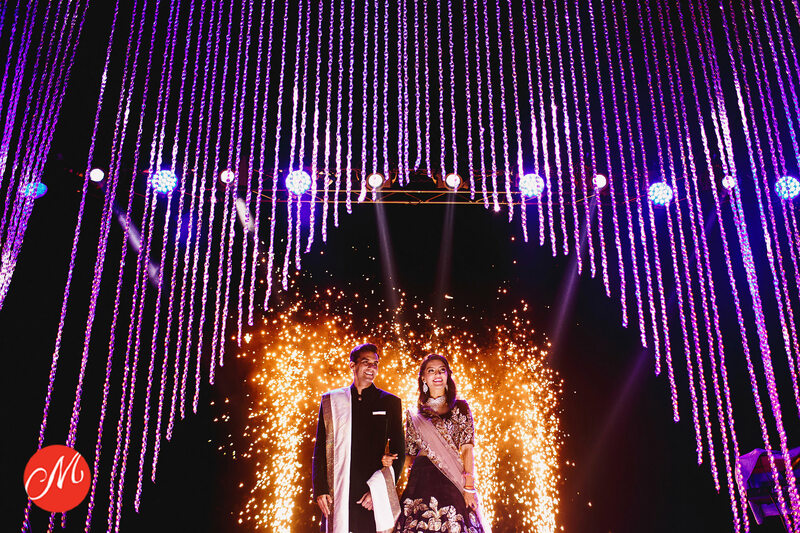 This photo is of the moment Saloni and Rishabh made their entrance into their final night reception at their three-day wedding in Dubai. After setting myself for the shot, in amongst their family and friends ready to greet them, I was taken by surprise by the pyrotechnics and had to change my camera settings pretty quickly to get this shot! I love their happy faces!! 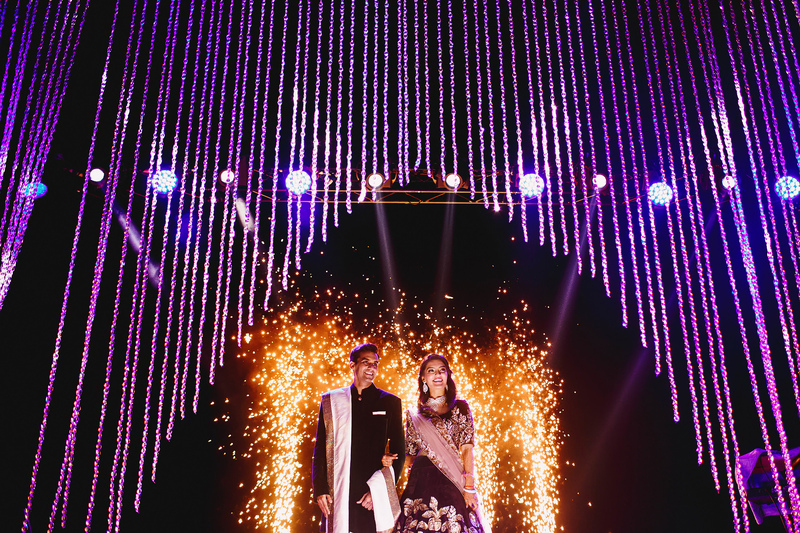 You can see more of their Dubai wedding on the blog here. I like to use my love of cinema as inspiration in my work wherever possible. I like to make images which look like stills from movies and I take a lot of inspiration from movie lighting. 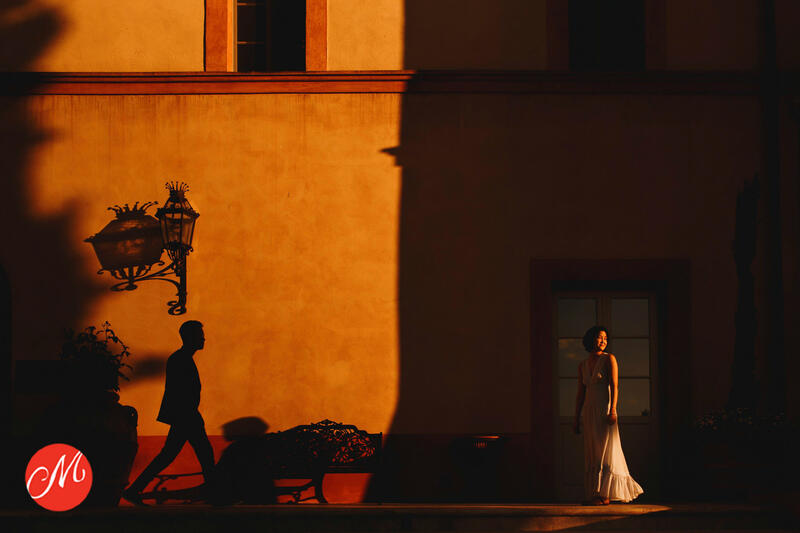 This photo was taken at J&E’s engagement session in Tuscany at Castello di Casole with the sun creating these epic shadows right at the end of the day, after a bit of playing around this was the final shot! You can see more from J+E’s Tuscany wedding on the blog here. One of my favourite moments ever. Lianne and Mark wanted to go out on the lake at Browsholme Hall despite a moody sky which threatened rain any moment. They were insistent and I was so happy that they were. I was sitting in a puddle in a boat to get this shot as they got out at the end of our sailing trip. Their bridal party had been watching from the shore and were there to make sure they got out of the boat without getting wet. I ended up with a very wet behind and one of my favourite ‘bridal party’ shots of all time. You can see more of Lianne and Mark’s Browsholme Hall wedding on the blog here. 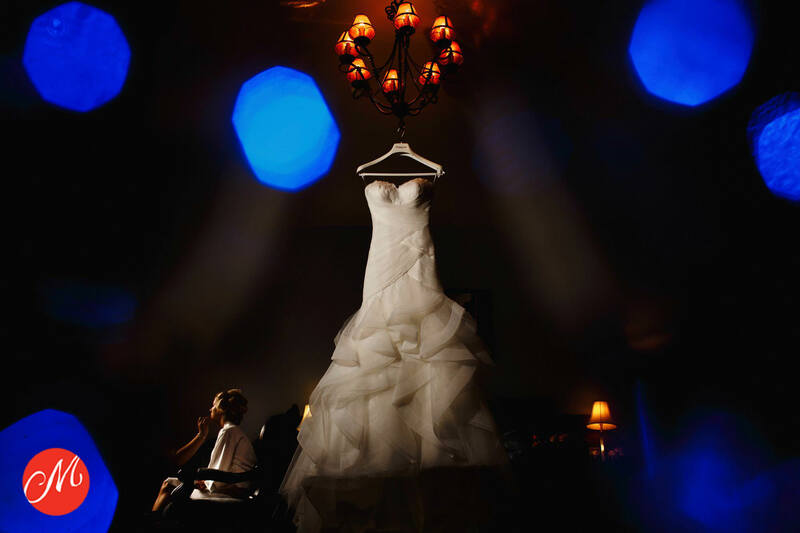 During a quiet bridal prep at Peckforton Castle with Katie, I decided to take a photo of her Pronovias dress. After a bit of playing around with lights I ended up lying on the bathroom floor to get this shot! 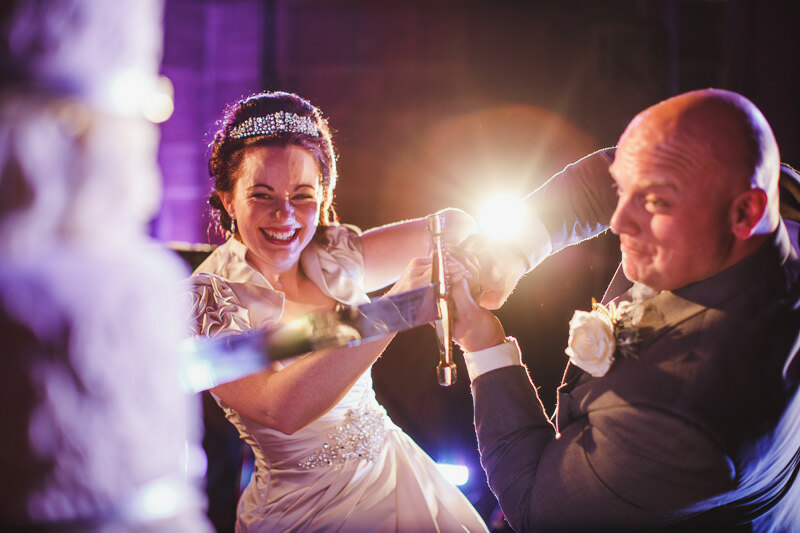 You can see more of Katie and Ali’s Peckforton Castle wedding on the blog here. It’s always been my goal to make unusual photos that are a bit different. M was getting ready quietly in the corner and while I’m not really a ‘shoe shot’ wedding photographer, far from it, I knew using the light I could make a cool getting-ready-detail photo for her. 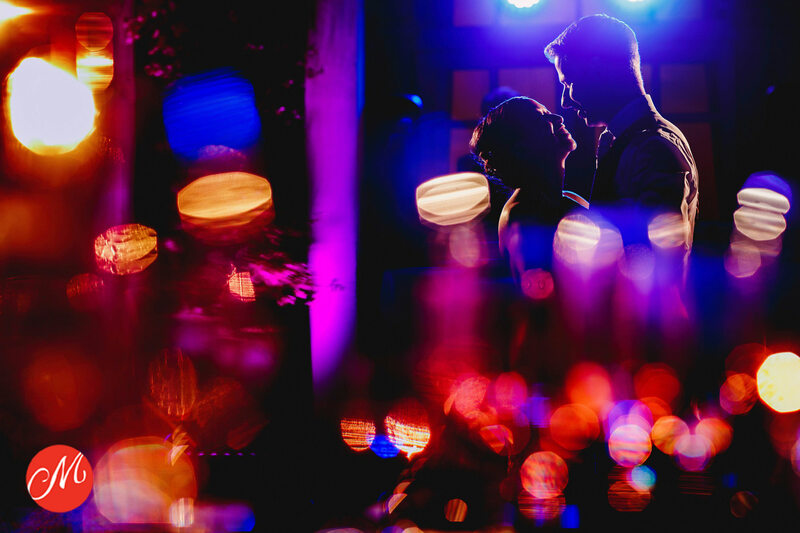 You can see more of M+S’s Jumeirah Carlton Tower London wedding on the blog here. Thornton Manor is a venue I’ve worked at a lot over the years. That in itself can be a challenge to come away with new and different images each time. That was easy at Amy and Amandeep’s wedding though as it was totally different to all the other weddings I’d photographed there. It was my first Sikh wedding and it took place outdoors in the garden. 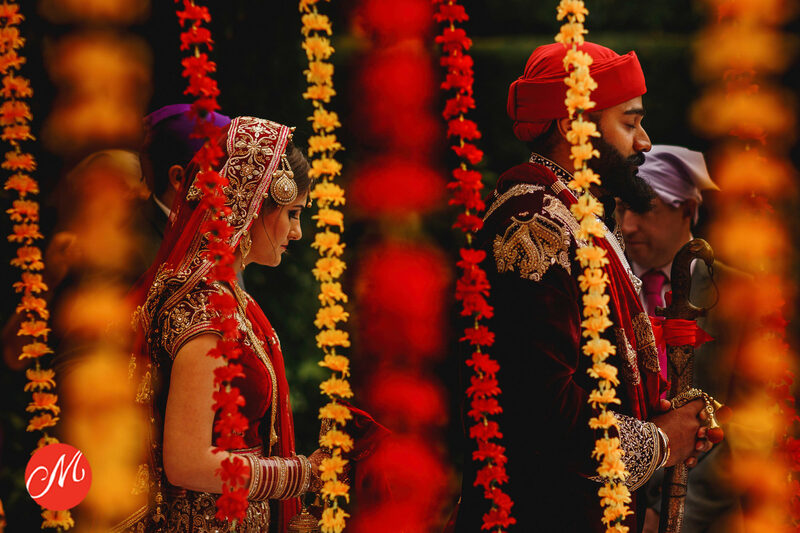 Sikh ceremonies are quite slow-paced so it gave me a lot of time to plan my shots and I was so happy with this photo! 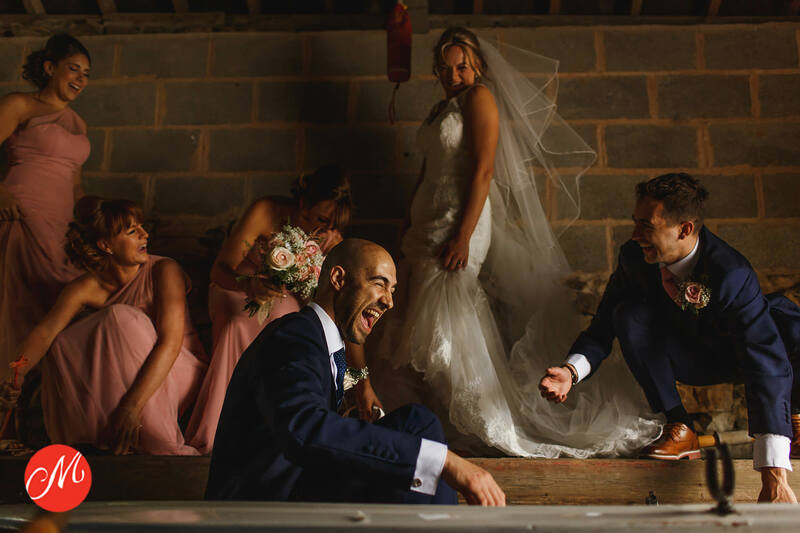 I raided my back catalogue for this photo as it’s one of my all-time favourites and was delighted when it was regognised with a Masters of Wedding Photography award! 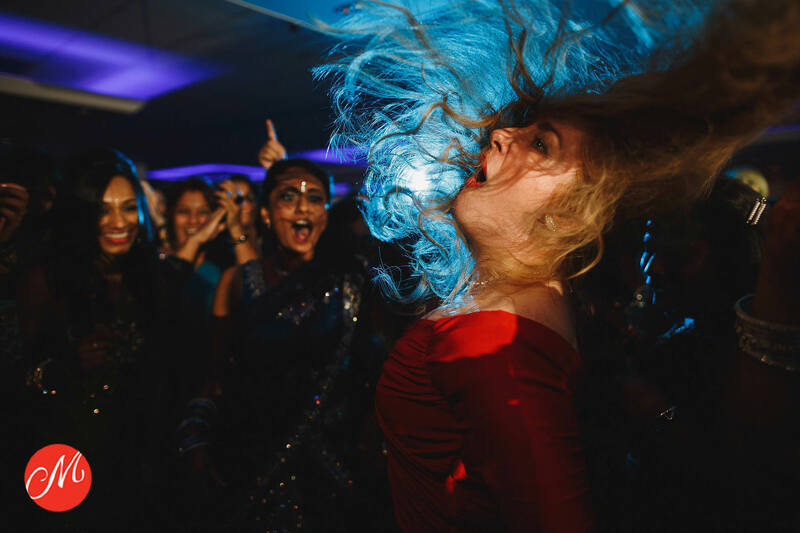 It was taken at Sajni and Mayur’s wedding in Watford during a very tense and action packed boys vs girls dance off. I don’t think I need to tell you who won! 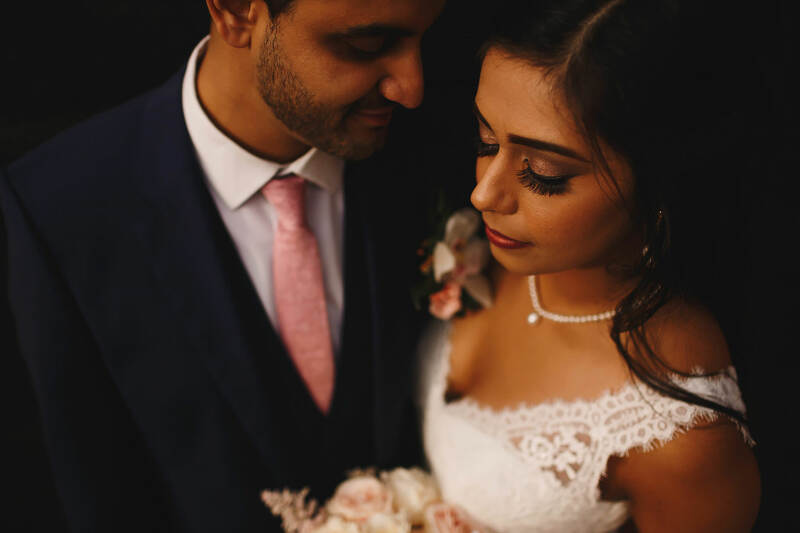 You can see more of Mayur and Sajni’s Watford Wedding on the blog here. This is the only ‘portrait’ in my 13 awards, which surprised me when I realised! It was during Mimi and Alfred’s wedding at Dartmouth House when we zipped around the corner in a taxi for some portraits in Green Park, London. These two were grinning and smiling and laughing all day long so I just joined in and we had a great time! You can see more of their Dartmouth House wedding on the blog here. I get asked about this shot more than any other. I like the mystery of it so I’ll just leave it at that! It’s my most awarded photo ever. 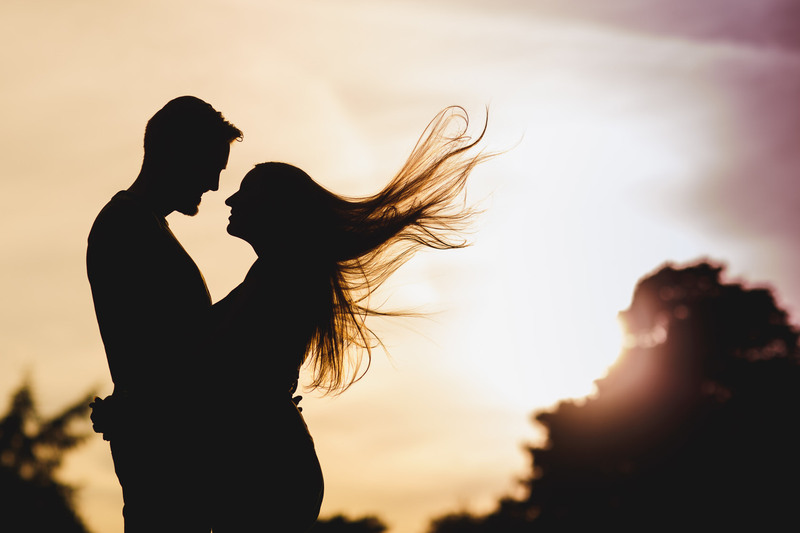 A lot of wedding photography is being in the right place at the right time. That comes with experience and with realising when emotions are running their highest and paying attention to people over the course of the day. 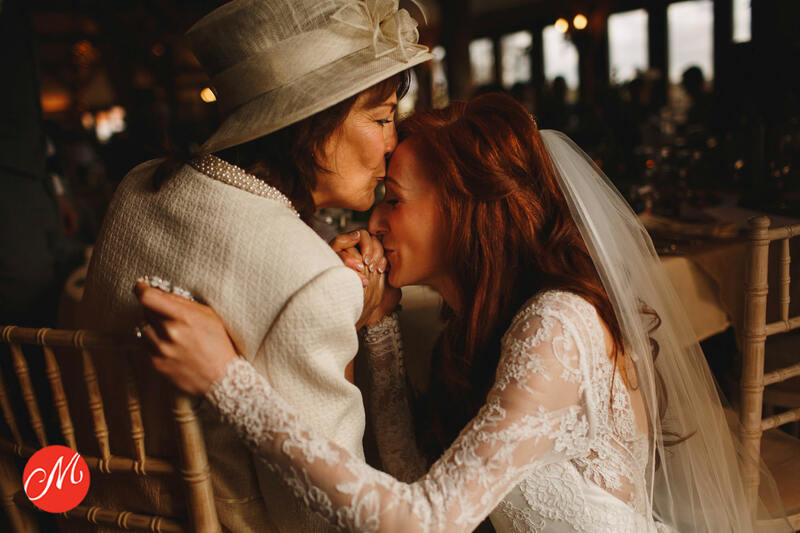 I was absolutely in the right place at the right time to capture this special moment between Kate and her mum. The amazing Rachael and Liam! During their first dance at Oh Me Oh My in Liverpool, I was down on the dance floor with them as usual but not really feeling like I was getting anything amazing as there was no space because their friends and family were packed so tightly around them. I made the decision to run super fast up the stairs and see what I could capture from the balcony above. Just as I got there, this happened! You can see more of Rachael and Liam’s Liverpool wedding on the blog here. The question I always ask myself is ‘did I capture how it felt?’ and here I definitely did. 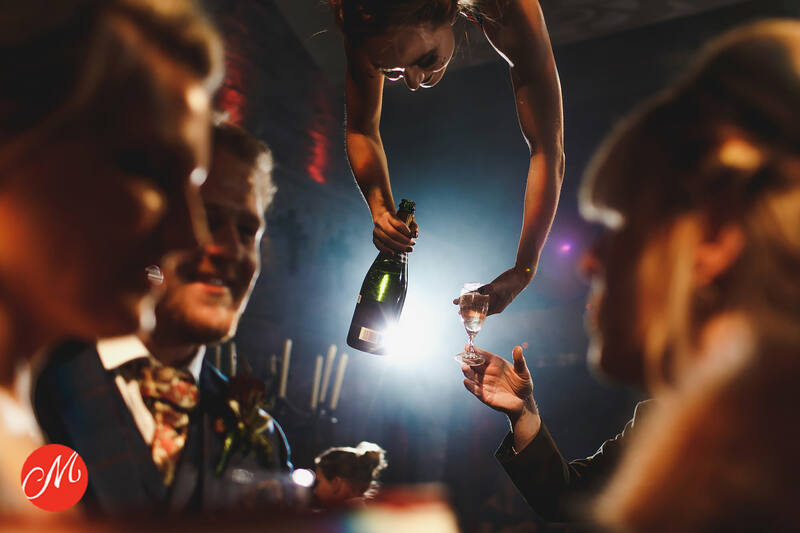 A crazy party at a crazy wedding in the midlands, people having the time of their life. 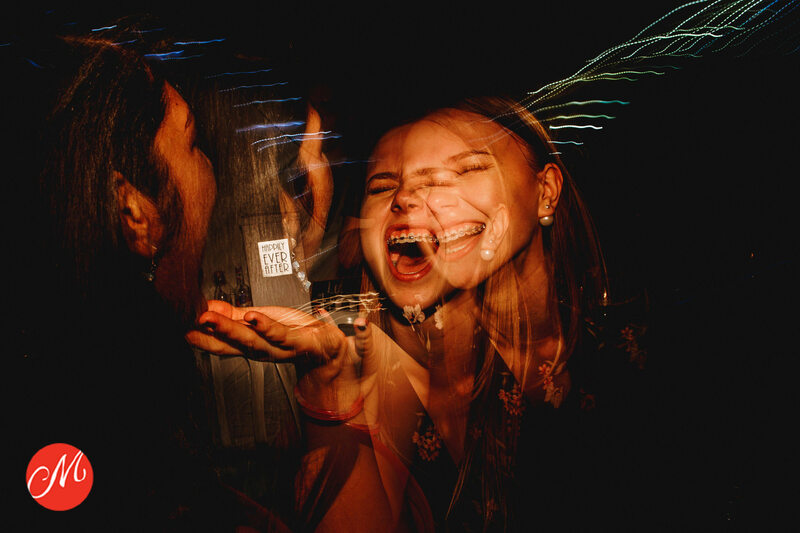 I was playing with different techniques because this was actually in a tiny tent with lots of clutter all around and I wanted something which really gave focus to the people and what an amazing time they were having. I’ll be honest, it was a fluke that my flash picked out the ‘happily ever after’ sign from the card box but for me that’s what really makes this shot. Denise and Steve, first dancing on the terrace of Belmond Grand Hotel Timeo in Taormina, Sicily. Lots of people have asked me if I set up this shot or asked them to pose for it and I absolutely didn’t. 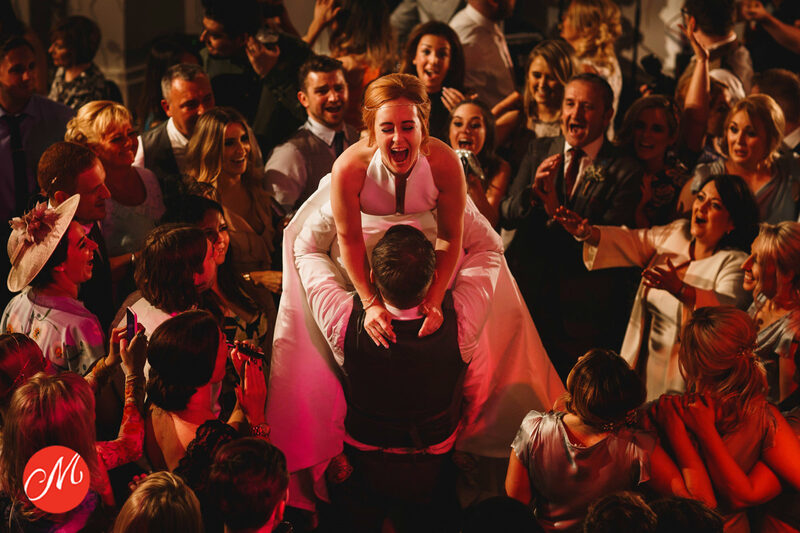 This is all them, loving life, at the end of their wedding day in magical Taormina under the multi coloured lights from the DJ, totally lost in the moment. You can see more of Denise and Steve’s Taormina wedding on the blog here. 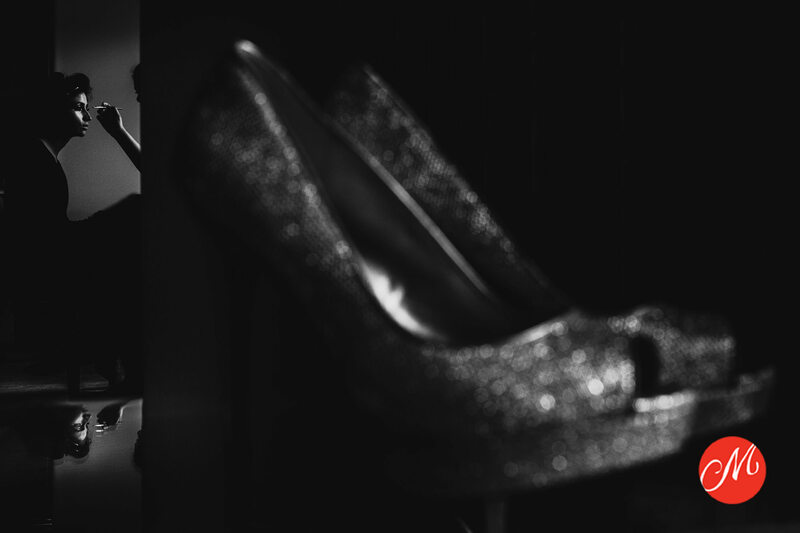 < Carrie + Adam. Styal Lodge. 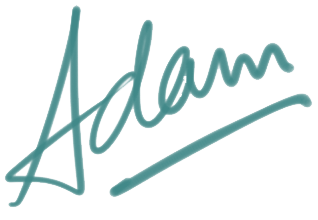 World class collection Adam!! Well deserved awards! Congratulations !! !